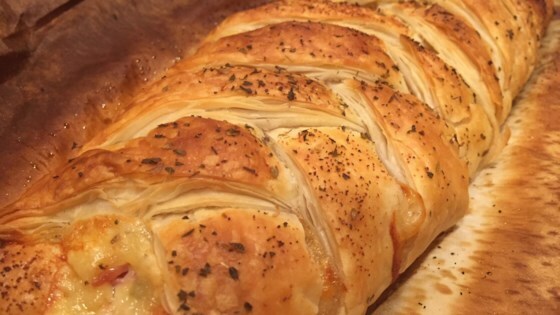 "Try this simple, Mediterranean-inspired puff pastry braid, filled with bacon, cheese, sundried tomatoes, and olives, ready for your next potluck." Roll out puff pastry over parchment paper. Spread Gouda cheese, bacon, sundried tomatoes, and olives in a vertical strip down the center of the pastry, leaving a 1-inch border on the top and bottom. Sprinkle with salt and pepper. Cut 1-inch strips toward the filling diagonally, along the side of the pastry, stopping before filling. Fold strips diagonally, alternating left and right, over the filling, creating the braid. Tuck the ends underneath and carefully slide the pastry with the parchment onto a baking sheet. Lightly brush with beaten egg; sprinkle herbs on top. Bake in the preheated oven until top is golden brown, about 35 minutes.